Artificial insemination isn't new, but the technique is still breaking new ground -- and it might just save one of the world's better known species. 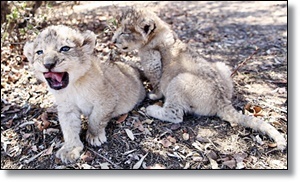 South Africa's University of Pretoria has successfully used artificial conception with lions for the first time, producing two cubs (Isabel and Victor, above) who've been healthy since their birth on August 25th. This wasn't a simple case of repeating familiar methods, either. The researchers relied on a new approach that could represent a breakthrough for species conservation. After collectiong sperm from a male lion, the team gauged the hormone levels of eligible females through blood samples to see when they would be well-suited to carrying the cubs. The only requirement was training the lionesses to rest next to a fence so that they could readily provide samples. Previous methods would have required moving the lions out of their existing habitat. Here, the females could stay in their existing environment.